Our approach is built upon the 5 cornerstones of online marketing: Content Marketing, Search Engine Optimization, Email Marketing, Social Media Marketing and an Optimized Content Management System. Our team of online rockstars have put together the best of the best, and the end resulted in fanspike! At Fanspike, content is considered king. We have writers on staff that help our clients with a range of digital marketing capabilities, including creating and promoting targeted content through search and social platforms. We’ve made a huge effort to provide you with the best of the best in content management systems. 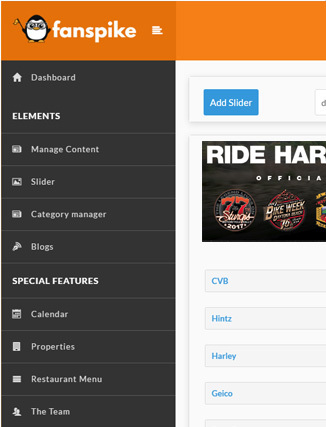 Our content manager systems is full of features that take your website to the next level. A Content System that's Fun to Use! Managing Content becomes a Snap. Fanspike is a result of 10 plus years of software development. Our content management system, combined with our team's Search Engine experience will help propel your company to the next level. Built for speed and performance. Fanspike powered websites offer the latest in mobile design. We offer 24/7 mission critical support. Contact our support specialist via phone, email or online support ticketing system. Built for top search engine rankings. We promote high quality signals and share unique content throughout the web and social media channels. 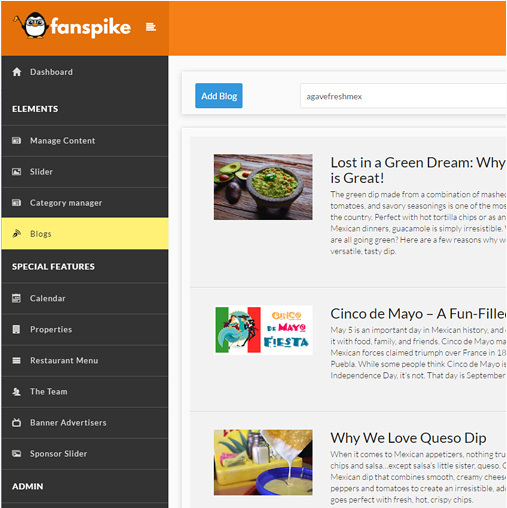 Fanspike is a content management system that powers websites of all sizes. Our system comes loaded with an assortment of tools and features that make content management a much easier process. This easy to use system is built to work with facebook and is optimized for Google.